Srisomboon, Yotesawee Zaidman, Nathan A. Maniak, Peter J. Deachapunya, Chatsri and O’Grady, Scott M. 2018. P2Y receptor regulation of K2P channels that facilitate K+ secretion by human mammary epithelial cells. American Journal of Physiology-Cell Physiology, Vol. 314, Issue. 5, p. C627. EL Nagar, Ayman Gamal Fawzy Sánchez, Juan Pablo Ragab, Mohamed Mohamed Mínguez, Carlos Balaguer and Baselga, Manuel Izquierdo 2014. 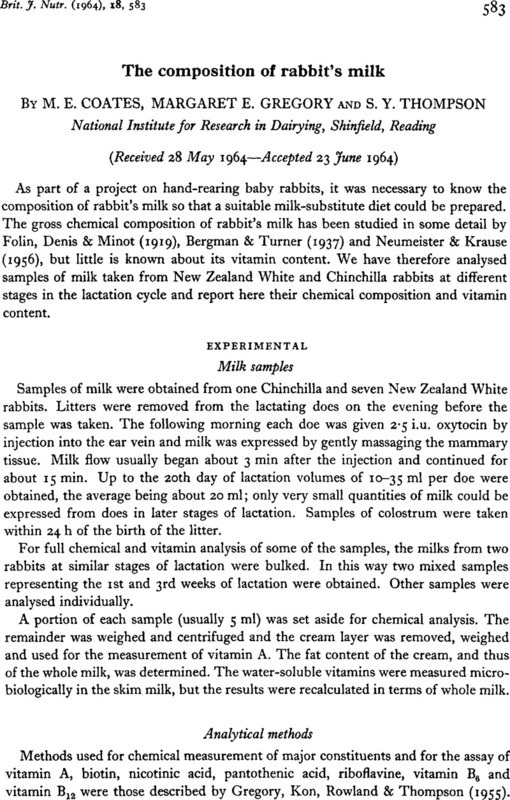 Genetic comparison of milk production and composition in three maternal rabbit lines. World Rabbit Science, Vol. 22, Issue. 4, p. 261. Bivolarski, B. L. and Vachkova, E. G. 2014. Morphological and functional events associated to weaning in rabbits. Journal of Animal Physiology and Animal Nutrition, Vol. 98, Issue. 1, p. 9. Quinn, Robert H. 2012. The Laboratory Rabbit, Guinea Pig, Hamster, and Other Rodents. p. 217. Skřivanová, Eva Worgan, Hilary J. Pinloche, Eric Marounek, Milan Newbold, C. Jamie and McEwan, Neil R. 2010. Changes in the bacterial population of the caecum and stomach of the rabbit in response to addition of dietary caprylic acid. Veterinary Microbiology, Vol. 144, Issue. 3-4, p. 334. Mataloun, M.M.G.B. Leone, C.R. Mascaretti, R.S. Dohlnikoff, M. and Rebello, C.M. 2009. Effect of postnatal malnutrition on hyperoxia-induced newborn lung development. Brazilian Journal of Medical and Biological Research, Vol. 42, Issue. 7, p. 606. Lopez, Suzanne M. and Rassin, David K. 1995. Brain large neutral amino acids and catecholamines in parenterally nourished preterm rabbits. International Journal of Developmental Neuroscience, Vol. 13, Issue. 6, p. 619. OFTEDAL, OLAV T. and IVERSON, SARA J. 1995. Handbook of Milk Composition. p. 749. El-Sayiad, GH. A. Habeeb, A. A. M. and El-Maghawry, A. M. 1994. A note on the effects of breed, stage of lactation and pregnancy status on milk composition of rabbits. Animal Science, Vol. 58, Issue. 01, p. 153. SANTOMÁ, G. DE BLAS, J.C. CARABAÑO, R. and FRAGA, M.J. 1989. Recent Advances in Animal Nutrition. p. 109. Lebas, F. 1988. III. 3. Non-ruminant herbivores; horses and rabbits. Livestock Production Science, Vol. 19, Issue. 1-2, p. 289. Lhuillery, Claude Martinet, Lise Demarne, Yves and Lecourtier, Marie Jose 1984. Food intake in captive leverets before weaning and the composition of the milk of the brown doe-hare (Lepus europaeus). Comparative Biochemistry and Physiology Part A: Physiology, Vol. 78, Issue. 1, p. 73. Partridge, G. G. and Allan, S. J. 1982. The effects of different intakes of crude protein on nitrogen utilization in the pregnant and lactating rabbit. Animal Production, Vol. 35, Issue. 01, p. 145. Jenness, Robert 1974. Nutrition and Biochemistry of Milk/maintenance. p. 3. Volcani, R. Zisling, Kivka Sklan, D. and Nitzan, Zafrira 1973. The composition of chinchilla milk. British Journal of Nutrition, Vol. 29, Issue. 01, p. 121. Henschel, M. J. 1973. Proteolytic enzyme activity in the gut of doe-suckled and hand-reared rabbits. British Journal of Nutrition, Vol. 30, Issue. 02, p. 351. Thompson, S. Y. 1968. Section D. nutritive value of milk and milk products. Fat soluble vitamins in milk and milk products. Journal of Dairy Research, Vol. 35, Issue. 01, p. 149. Gregory, Margaret E. 1967. Section D. Nutritive value of milk and milk products. Water-soluble vitamins in milk and milk products. Journal of Dairy Research, Vol. 34, Issue. 02, p. 169. Bánhidi, Z. G. (1958). Acta chem. scand. 12, 517. Bergman, A. J. & Turner, C. W. (1937). J. biol. Chem. 120, 21. Collins, R. A., Boldt, R. E., Elvehjem, C. A. & Hart, E. B. (1953). J. Dairy Sci. 36, 24. Davies, J. S., Widdowson, E. M. & McCance, R. A. (1964). Brit. J. Nutr. 18, 385. Folin, O., Denis, W. & Minot, A. S. (1919). J. biol. Chem. 37, 349. Gregory, M. E., Ford, J. E. & Kon, S. K. (1958). J. Dairy Res. 25, 447. Gregory, M. E., Kon, S. K., Rowland, S. J. & Thompson, S. Y. (1955). J. Dairy Res. 22, 108. Henry, K. M., Houston, J. & Kon, S. K. (1940). J. Dairy Res. 11, 1. Houston, J., Kon, S. K. & Thompson, S. Y. (1940). J. Dairy Res. 11, 145. Neumeister, H. & Krause, B. (1956). Arch. Geflügelz. Kleintierk. 5, 199. Nixon, D. A. (1953). J. Physiol. 120, 27P. Rook, J. A. F. (1961). Dairy Sci. Abstr. 23, 251. Rook, J. A. F. & Wood, M. (1958). Nature, Lond., 181, 1284.